Big changes are planned for the Cinquecento. Fiat showed up to the 2019 Geneva Motor Show with an electric concept called the Centoventi. Even though the concept is meant to be a replacement for the current Fiat Panda, it will have something in common with the next generation 500. Fiat has confirmed to AutoExpress that the next-gen 500 will go all-electric with a focus on luxury. We will get to see this new model in production form exactly one year from now at the 2020 Geneva Motor Show. Francois did not confirm whether or not the production Centoventi would ride on the same platform as the next 500 but said the 500 would ride on a new electric platform that FCA is currently developing. "It’s a new platform designed for electrification. It makes the car radically different. It’s still a 500, same size same proportions, but it’s just not the same car. The 500 of the future," said Francois. Along with the change from a gas engine to an EV drivetrain, the new 500 will likely move upmarket in price. Francois said he didn't think a price increase would impact sales because "the appeal of the 500 is so strong we may not lose customers." Fiat already sells expensive special edition versions of the current 500, so buyers may be willing to pay more for an electric model. 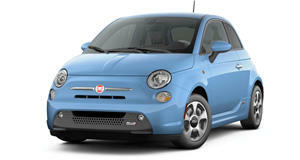 We think the Fiat 500 is a perfect candidate to go all-electric. The only downside will be the loss of the 500 Abarth, which has one of the best-sounding four-cylinder engines in the world. Perhaps Fiat will find a way to make the electric Abarth model produce a futurist electric sound. We decided to reach out Fiat to see how the Italian automaker was planning to recapture the distinct sound of the Abarth with an electric model. A spokesperson told us "This year marks the 70th anniversary of Abarth. In addition to enhanced performance and an aggressive appearance, the Fiat 500 Abarth undoubtedly draws attention with its unmistakable growl from its signature exhaust" but declined to comment on a future product.